Background: Imprisoned on the other side of the universe, the mighty Thor finds himself in a deadly gladiatorial contest that pits him against the Hulk, his former ally and fellow Avenger. Thor’s quest for survival leads him in a race against time to prevent the all-powerful Hela from destroying his home world and the Asgardian civilization. Review: I was waiting so long for this movie and I’ll admit I was very pleased as a comic book fan and as a movie fan. The visuals were stunning and everyone on the cast gave a great performance but that doesn’t mean that this movie was necessarily perfect. First of all, this movie’s humor REALLY highlights how funny Chris Hemsworth can actually be, he was great comedic relief! Tom Hiddleston still brings his charm to the role of Loki, however many movies in the MCU recently(except for Spider-Man Homecoming in my opinion) have had this problem and “Thor: Ragnarok” falls into that category as well with it’s addition to Marvel’s, as I like to call it, one-note villains roster. 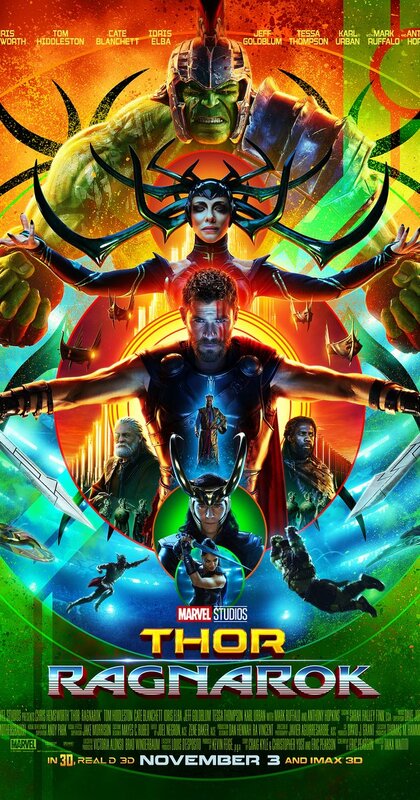 Hela, while visually was great and Cate Blanchett gave a stellar performance, there was really no reason to connect or feel the character’s pain and motivation. Karl Urban’s Skurge to me was also a letdown, he was mostly comic relief and right when there was a chance to give him a good arc, they went around and stuck with him just being truly unnecessary. Valkyrie(Tessa Thompson) and Heimdall(Idris Elba) however were really good and I’m happy that Heimdall got some much-needed character development and was actually fleshed out. Jeff Goldblum also was very great and left a great example of how good his Grandmaster can be going forward. Now lastly, Ruffalo as The Hulk was way more comedic than intended but was still a delight and his chemistry with Hemsworth’s Thor was amazing and even his chemistry with MCU newcomer Tessa Thompson’s Valkyrie was great. All and all, I give this movie an 8.5/10, this movie was visually great and very comedic but it lacks any real connection or heart. You don’t really feel connected to these characters even though the movies wants you to so badly.